The Amazing Spiderman was amazing indeed! When I saw the first trailer for The Amazing Spiderman, I was disappointed. It looked thrown together, and the opening sequence which showed Spiderman's first person perspective looked similar to Mirror's Edge but just fake enough for me to hate it. I was also disappointed because I thought it was too recent since the last set of Spiderman movies and I wasn't looking forward to another Hollywood flop. Here is that first trailer. But then the second trailer came out, and I had hope! Peter Parker looked to be a spunky, funny, peculiar teenager with a hidden past and issues to sort out. The question of Parker's mysterious past was new to me; I've read a lot of Spiderman comics, but all over the place and not recently. I wondered what it could mean, who his parents were, and the fact that I saw that they were going to explore this, combined with seeing Spiderman joke around while busting car-thieves, well, I became really excited to see it! I was going to see it opening week, but I got busy and then someone I know said they saw it and didn't like it. I was back on the fence. But, after talking with some friends of mine, they reassured me that it was worth a shot. A close friend in particular referred to it as, "a Peter Parker story" and told me I'd enjoy it. And enjoy it I did! The movie was fantastic and was both fresh and true concerning the character. Once again, I will do my best to avoid spoilers. The origin was more or less the same, except they stress his parents' mysterious past, working with Dr. Connors on some secretive and revolutionary biological research. Parker gets his powers from a mutated spider's bite, but unlike the previous rendition, does NOT get the ability to make webs on his own. Just like the comics, Peter must invent little wrist launchers which can generate and shoot the webbing he needs, which he conveniently steals/buys/acquires from Oscorp. This little detail is so loaded because it gives us the chance to see some of Parker's intellect in action, and makes us respect him a little more. Other details from Spiderman's origins and from the last rendition in film (a la Tobey Maguire) are explored and expressed in a refreshing way. The fight with the jock at school was Parker's doing this time, and the underground wrestling bit came up briefly but was simply and brilliantly used to give Parker the idea of wearing a mask. The action was incredible! I am not really a 3D guy, but if you are, I would highly recommend it for this movie because the action seems worthy of that amount of dimensions. The cinematographer did a fantastic job of making Spiderman feel real, and kept the audience connected and refreshingly excited by Spiderman's movement and actions throughout the city. His movements are fast, fluid, graceful, and extraordinary, just as they should be. When he runs from thugs as he begins to understand his powers, Spidey moves like someone who has done parkour, which is always one of my favourite parts of seeing Spiderman in action. Added to that, the movement switched between first and third person perspective for some of the swinging and it was used sparingly enough to be exciting, as opposed to forced, tedious or repetitive. Concerning his fighting and movement, I was very impressed with one particular scene where Spiderman really does look like a spider. While wrapping up the Lizard at one point, Spidey swirls around and around him, crawling all over him so quickly that it really does look like a spider wrapping something in a webbed cocoon. The movie did a really great job of making Spiderman unique and not just super. Another thing, which a friend pointed out to me, was how Parker moved as Spiderman. In one scene, you see the worlds of Peter Parker and Spiderman merge when he gets a phone call from his aunt, asking him to bring home some groceries. During this time, he is wearing the suit, but he is acting like a teenager. Exaggerated body language, weird idiosyncrasies, here we see that he isn't someone else when donning the suit, and we see that under that mask lies a teenager who doesn't want to be on the phone with his loving, but nagging aunt. It's a nice touch, and just like so many others in the movie, just adds to the overall impression. The Stan Lee cameo, which by now is a staple of Marvel comicbook movies, was quite hilarious and very well done, just thought I would mention it. There was even the power of the people moment, as I call it, where some people of New York stand together to help Spiderman. It was delivered well, and was a nice, feel-good moment. Andrew Garfield's performance as Spiderman was impressive. I had never heard of him before this movie (having not seen The Social Network), but he did a truly wonderful job of portraying this character. I am no expert, but I pay close attention to what makes a character who they are in comic books and movies, and Garfield's Parker was top-notch. He combined quirky with confident, shy with spunky, angry yet morose, all the traits which make Peter Parker, Garfield exuded and built upon them in a way which was astonishingly similar to the character I had only read about before. Above all else, this is a Peter Parker story, as promised by my friend. It is the story of a teenager who not only lost his parents, but does not know how or why. It is the story of a boy trying to become a man, who's life has taken on a crazy turn. It is also a hero's journey, from denial, through vengeance, to sacrifice. All of this, all of the struggle, and all of the man behind the mask, is what I love about this genre, and this movie pulled it off whilst culminating in a heroic, well deserved resolution. The movie seemed to hold something back though, as you'll see in the after-movie-after-some-credits extra scene as I'm calling it, and The Amazing Spiderman 2 is scheduled for 2014. It seems that the secret of Parker's parents is still out there, and while I would normally be upset with this lack of closure, I appreciated how it was done and look forward to the next one. P.S. If they even think about casting anyone other than J.K. Simmons as J. Jonah Jameson in the next one, I will lead the protest! There was a summer sale on video games this past week and during that time, I bought and played through Mirror's Edge. I am sure my friend at Post-Launch Reviews will get around to writing a review on this amazing game, but for now, I thought I would include some thoughts on it. Mirror's Edge is described as a single player, first person, action adventure, platform game, and that's about right. I like to call it Parkour: The Game. Mirror's Edge follows the story of Faith, a Runner, a courier of secret and illegal messages in a city tightly controlled by a totalitarian police force. Running along rooftops, through maintenance tunnels, Faith and the other Runners keep the lines of communication open for anyone who needs them. Let me just say that I enjoyed the game, it seems I don't have much to not hate right now, referring to my latest blog posts. Mirror's Edge is fun, exciting, and unique. The level design is beautiful, and beautifully simple. The city is mostly a shining white, a monochromatic metropolis which clearly and easily gets the point across of a city held under tight control. Runner's Vision, your aid in this world, is simple a way of highlighting structures and paths in red to alert you to possible routes through the city. I love the movement system in this game. It's one of those great achievements in video games where they are able to slowly impart certain skills onto the player and eventually, the player's movements are so fluid that any struggle was worth it. The opening cinematic suggests some of this grace and by the end of the game, I had achieved it. This was great, not only for how fun it was, but because it made me feel like I accomplished something, that I fit and excelled in this world. Instead of speaking in the theoretical, let me describe the movement system a little, since it is the crux of the game. Not incredibly different from the Prince of Persia games, (I almost put Price of Persia, I guess that would be priceless since it doesn't exist anymore? ), or Assassin's Creed games, you move through the environment, climbing, jumping off walls, and using what's near at hand. The main difference is the first-person perspective. During testing, apparently the game was so convincing, was too real, that they had to add a targeting reticule in the middle of the screen to centre people. You can remove it if you want, I left it because it's subtle and was nice to have. But yeah, you can run, jump off buildings, run along walls, climb stuff, slide or vault under/over objects, it's fantastic! Once you're an expert, you can quickly take in the look of a room, and then perform several of these feats at once, combining your movements into a fluid progression which doesn't stop and makes you feel awesome. Besides falling, your main obstacle, well besides obstacles, is the police force. Some seem like beat cops with a simple uniform and handgun, while others are part of a stricter security force and have shotguns, machine guns, and body armour. There are several ways of taking them out, with your default being punching/kicking them, disarming them, or shooting them once you get their guns. I personally vowed to never shoot anyone in that game as it seems unnecessary. Here is a game which gives you a great opportunity to try something different, instead of blasting your way through enemies with no thought of the consequences. You have no armour, and if you get shot, or pistol whipped, the level will restart, but if you keep moving, you are hard to hit, and really, it not only makes sense, it makes for a lot of fun. I felt like a ninja playing this game, and was a little upset at all the walkthroughs I had seen where players had simply shot the enemy as soon as they had guns. Way to not challenge yourself. You can also run away from most of your enemies and never engage them which is just challenging enough to be rewarding. Additionally, if you kick them while wall-running, they'll spin around, allowing for a quick disarm. The last cool move is one I call leap-frogging, where you land completely on top of a guard, taking him out and disarming him. It's a fun move, one which had me thinking of Nightcrawler from the Marvel X-Men comic/TV show/movie(s). I have two complaints about the game. The first is that it is too short. Sometimes, brevity is great in a game, it's the soul of wit, and sometimes a game doesn't have enough to provide more and it keeps you wanting more. That is the case here, which leads me to my second complaint: there is not enough in the combat system. After awhile, I had performed every possible takedown on a guard possible, several times, and it was getting slightly stale. I don't mind either complaint so much though because I would rather deal with those rather than some have been forced entertainment, grinding, or even just a case where the aim far exceeded the grasp. Mirror's Edge is a great game which will always stand alone in my mind. I really hope they make a sequel and add in some more combat features because if so, I will gladly give the developers more money. After reading a couple of my recent blog posts, you might think that all I do is watch TV and play video games. That's not true! I also read, write, and draw! No, with me, I'm usually just doing several things at once so I consume a decent amount of media in a short amount of time. I started watching Nickelodeon's Avatar: The Last Airbender (referred to hereafter as Avatar) quite a while after the show started, but I caught up quickly and enjoyed every minute of it! When I heard that a new story, The Legend of Korra was coming out, I awaited quite anxiously. The premise of Avatar is simple: the world is comprised of separate tribes and filled with magic and spirits. The magic of the realm is that some people are born with the ability to bend, to control one of the four elements: earth, air, fire, or water. All except the Avatar, who is the bridge between the mortal realm and that of the spirits, who is able to control all four elements, once he or she has mastered them. Mastery of the elements comes from a combination of spiritual/philosophical training as well as martial training. In Avatar, the eponymous character was thought to be dead, but was found as a boy, reincarnated from the previous master. The Fire Nation, bent on conquering the rest of the world wars against the Avatar. In this new series, Korra is a spirited young avatar who already has mastery over the water, fire, and earth elements, but air eludes her. The story takes place just one generation after the previous, and the nations are no longer at war. However, the non-benders of the world start to feel oppressed by those who can wield such great power. A character named Amon, who has the ability to remove a bender's powers, leads the revolution. For those who have watched Avatar, you'll obviously enjoy the show as the same basic elements (pun intended) are there: comedic writing combined with impressive emotional depth, as well as a compelling main character and storyline. For those new to the series, you really won't need much more than what I wrote above to follow along, other than names perhaps. The story, a mere one generation later than the previous show, has a different vibe than the original. Instead of being a world of separate tribes, the people have come together and improved upon community and technology. The Legend of Korra acts as if set in the 1930s, with cars (or Sato-mobiles, haha) everywhere, and that all-too-familiarly cheesy radio host voice who narrates the opening of most episodes. The atmosphere is busy, exciting, a world of promise. Bending competitions are a thing enjoyed by benders and non-benders alike, in which two teams of benders attempt to play element dodgeball, essentially. The struggle of the non-benders accelerates quickly, as Amon works his way into the hearts and minds of the common people. Convincing them that benders are oppressive and that everyone should be equal, he quickly garners a considerable amount of support. Terrorism, totalitarianism, and teenage-angst collide in this show in a way which makes me appreciate how a cartoon, a show seemingly for children, can present so much interesting and investing entertainment. The show is continuing its tradition of blurring the line between good and evil, showing how ambition and good intentions can be misled. The aim for equality can be a noble one, but at what cost? What gives the benders, those just born with these abilities, the right to wield them? Why hasn't someone invented guns to just shoot the benders? (as one friend of mine is nigh-constantly asking) Most of these questions, and more, The Legend of Korra presents, challenges, and explores as the show progresses. I won't go much further than that, but if you're at all interested, I say give it a shot, you should find something compelling enough to keep your interest. The first season just finished, with 12 episodes and the promise of more, and I look forward to following Korra on her adventures. FOR ANYONE WHO HAS SEEN THE SHOW, READ BELOW, THIS IS YOUR SPOILER ALERT WARNING! I'm really wondering where things are going to go with this new season. I mean, it would have made sense for Korra to lose her other abilities and have to regain them over the course of the series, as she struggles to learn more about Amon, and even the strife of the people. But, I guess the original show followed this formula and they didn't want to repeat that. Korra having all of her powers is kind of crazy, or at least it means her later adventures must be. It's Superman all over again, where the hero is so over-powered, why should you care? What do you pit against them? But, I'm sure the show will pull through, it's just that I have no idea where they're going and that's both interesting and maddening. One last thing, Korra and Mako's relationship has me kind of tilting my head to the side. I mean, I guess it makes sense, but Mako's proclamation of love was a little quick in my opinion. Sure, he cares for her, sure they've been through a lot, but I'm wondering where it's going to go, exactly. Oh well, just because I'm hesitant with love doesn't mean fictional animated characters should be, should it? Those were my quick thoughts, I hope you've been enjoying the show and my blog! In a flurry of enthusiasm, I dove into the second book and season of Game of Thrones and loved every minute of it! The story intensifies as the struggle for power divides the entire kingdom of Westeros. Armies march and sail to war, and betrayal and magic run rampant. I mentioned in my previous post that it seemed as if magic was just waking up in this fantastic world, and the consequences and effects of that magic are explored here in season 2. The characters and their stories continue to develop and it is incredibly exciting to witness the events from their eyes and even notice the same events from opposite perspectives, opposite sides of the same conflict. The casting proves itself again especially because Tyrion Lannister becomes such a prominent character. Peter Dinklage, who plays Tyrion, does an incredible job at his role, perfectly bringing the character to life and even adding an embellishment or two. He is one of my favourite parts of the show, and his delivery is excellent. The character is a very interesting one to begin with, and Dinklage's performance is one I look forward to from episode to episode. Tyrion's character is clever, witty, and altogether bawdy. He is an incredible antihero, saying what most are too honorable to say, and is constantly making fun and pointing out the foibles of the other characters. This season gives him a chance to take a stab at power and responsibility and it is fascinating to watch him try to do the right thing, acting as if he's just as viperous as the rest of the schemers. Jon Snow's adventures in the north are quite revealing, as we get a chance to see some of the most primal parts of Westoros. While the entire world is at war, the north yields a mystery and a threat which could be larger and more dangerous than all the other armies put together. Jon's fate seems to be one of some importance and following his story in the book and season was really interesting for me. Objectively, his journey could be considered quite tame at this point, really at the edge of action, leading up to something bigger, as the threat of which I speak only really reveals itself toward the end, but the intrigue and the development, while slow compared with the rest of the kingdom, is still captivating. Arya is quickly shaping up to be of great importance and interest. Her character has always been quite enjoyable, starting in the first book/season as a stubborn youth who learns to fight, breaking the gender roles traditionally placed in her world, and this book and season give her a chance to grow some more and show off some of her cleverness. In an attempt to flee from the dangers which face her, she becomes captured by Tywin Lannister, father to the Queen and to Tyrion. The interaction between Arya and Tywin is riveting, laced with extra meaning, and one of those interactions which make one wish that the "bad guy" wasn't the bad guy after all. Arya's story is only really beginning and I'm really excited to see where she ends up. Meanwhile, Bran's dreams are becoming more powerful, becoming real, and his abilities continue to grow and expand in potential and in shape. For now, the events which surround his life seem quite tragic and out of his control, but as his power continues to grow, I look forward to seeing how and where his actions fit into the war for Westoros. Theon Greyjoy. I have tried to write this blog as spoiler-free as possible, and I will continue to do so, but forgive my roundabout way of writing this, and forgive me if I accidentally let a spoiler or two slip. Theon's journey is a sad one. Caught between a rock and a hard place, literally, he is forced to choose between two very different lives and either choice has deadly consequences. While I ended up not liking him, I felt truly sorry for the path which lead him there, and his decline, his bumpy fall, was hard to watch. Also, I felt more sympathy for him from the show than the book, which I find a little interesting. The rest of the characters are, of course, fascinating, but I just wanted to give you some of my highlights. The world is at war, and everyone is plotting, scheming, and fighting for power. Dragons are alive once more, a sorceress unleashes deadly assassins made of shadows, warlocks cast illusions, and dreams become real. As soon as Storm of Swords becomes available in the library, and as soon as the next season comes out, I will be first in line to catch both, and if you are willing to join me, you're more than welcome to! Life is rolling along pretty well right now, and I figured that since I had a few moments to spare, I would spend that time catching you up on what's been going on. The short answer is not much. Life has been steady, and steadiness does not usually make great news. But, still, I feel the need to write, so hopefully you feel the need to read...hmm, wonder if a library has ever used that for a cheesy poster. I can see it now, Snoopy on a plane made out of an open book with the question "Do you feel the NEED to READ?" Anyway, I digress. My training has just about finished at Shaw. By the end of the week, I will be completely off the training regimen and working a regular, full-time schedule. I had a bit of a concern about that when I noticed my schedule had me working 7 days/week, but after speaking with my supervisor, that's just a weird computer remnant from training. I'm really looking forward to training being done. I mean, the hours of training have been consistent and I will miss their regularity, but it will be nice to just walk in, jack into some good ice (that one's a Neuromancer joke for Marco and Mike, haha), and do my job. No more meetings, no more restrictions, it is going to be nice. Sure, like every job, it will be boring, repetitive, annoying, and the days where I have to start at 7am or finish at midnight will be extremely tiring, but still, a job's a job, and it will be nice to be allowed to do it. My apartment is feeling a bit more comfortable lately. My landlord had to do a couple of renovations, but that couple turned into a few, and then became a bunch in short order. Needless to say, I will have been here for two months and I still don't feel completely moved in. But, I've been assured that by the end of the week, it will all be done, and since everything's been for the improvement of the place, I don't mind that much. I recently obtained Shaw's Extreme internet, and while completely biased because I work there, I have to say, it's pretty awesome! Connected to my modem right after installation, I was getting 23.55 Mbps download and 1.77 Mbps upload speeds, and with a 6 month promotion, I'm paying considerably less than I was in Toronto, and for almost 3 times the bandwidth! I had considered going with an employee account/discount but they didn't have a standalone internet plan; everything included phone or television and I don't really need either. In any case, the internet is awesome, and shockingly enough, it's one of their lowest tiers of internet speeds. I've been looking into grad schools. Nothing too elaborate yet, but I think I'm narrowing down my field of interest. It's been tough because I can't just sit there and say, "Hey, I want to learn about this" or rather, I can, but about way too many subjects. It's tough to narrow it down to one field, let alone topic. But, as I read through graduate programs at different universities, some of them grab my interest. I'm hoping to have it narrowed down completely by August/September, and then begin applying. Knowing myself, it'll seem vague until I just accept what's been in the back of my mind all along. Tomorrow marks the 2 month anniversary since I first came to Alberta. I honestly cannot believe it's been that long already. Things have been working so smoothly that I don't feel the passage of time. To be fair and extroverted, I want to thank my friends and family. Everyone has been so amazing and have really helped me be prepared and comfortable with this move and with getting settled. I don't think I would be nearly as comfortable, or deservedly so, without their support. To be fair to myself and introverted, I think I am pretty decent at adapting. While change can be unsettling, I often remark to myself that there is no reason to complain about it. Just roll with it and make it work. 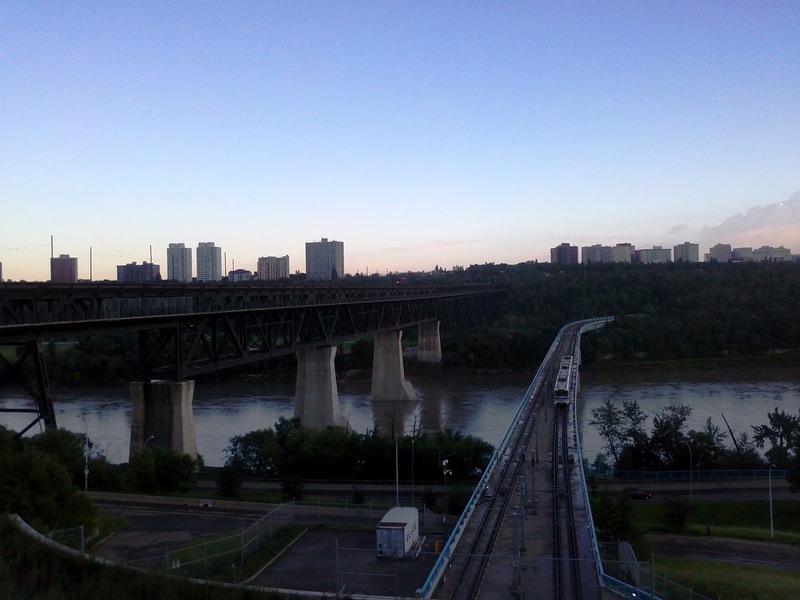 Moving to Edmonton was a big step, but really, hasn't felt that difficult or confusing. It's probably a combination of all factors, but either way, I acknowledge the support I've had and the luck I must have in order to feel this way. Also, I'm faster than buses. No, it's true! The past three nights, I've been walking places, hoping to catch the bus but too energetic to stand still, and each time I've almost made it to my destination before the bus catches up with me. Tonight, I walked from my apartment to Brittany's, and didn't see a single bus. I know, I know, buses are delayed and I'm not really faster than buses, but, give me the right music and I can do anything. The only music on my phone are the soundtracks to Tron: Legacy, The Transformers OST, The Dark Knight OST, and Two Steps from Hell. I have a hard time not powerwalking places, haha. Here are some photos I took on the walk to Brittany's tonight. See the train car to the middle of the right on top of the bridge? Here's a closer image of it! I was lucky enough to get one with the subway rolling past. 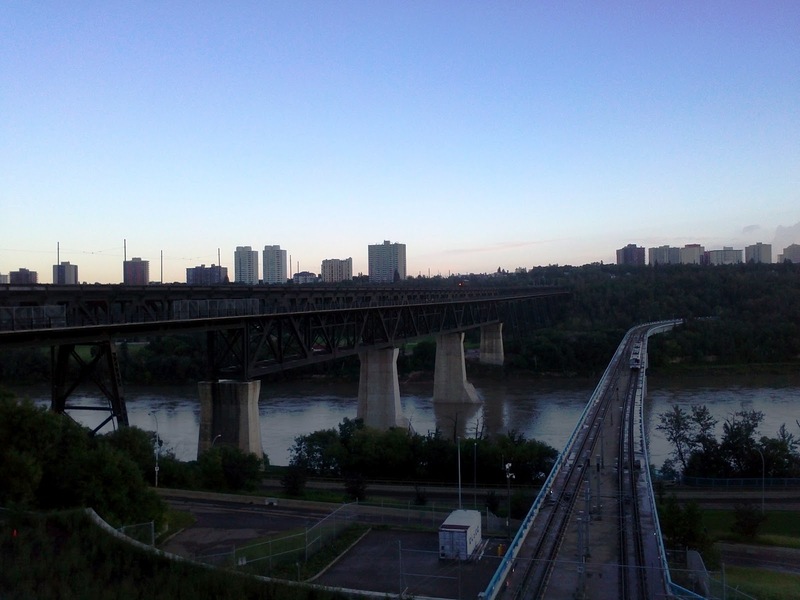 I know I've taken more photos of this bridge than you'd ever care to see, but I really like the view! 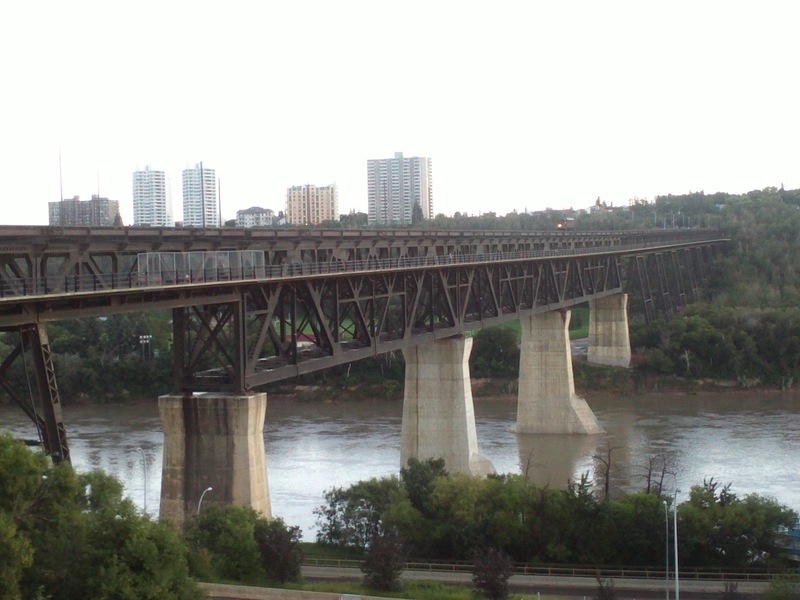 This is from the north side of the northern Saskatchewan River, looking south. I saw a park on my way, and stopped in to take a look. 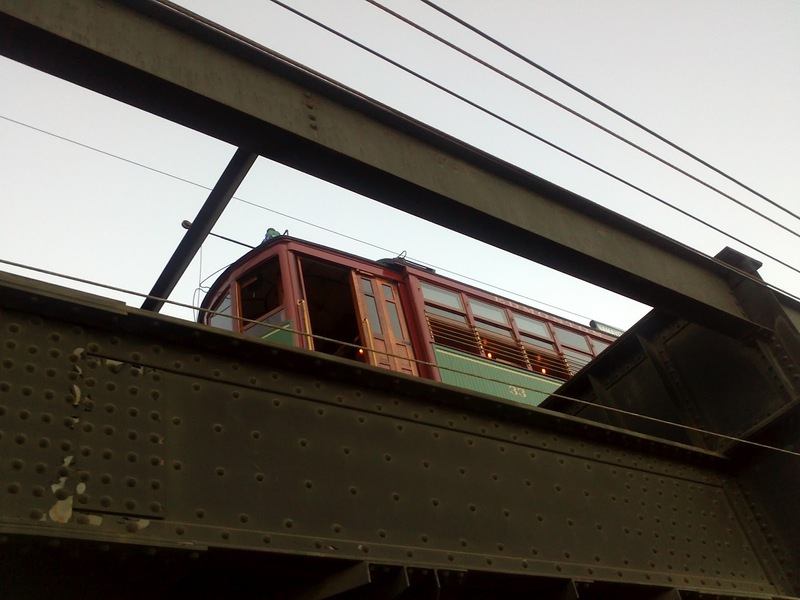 I saw a train car on top of the tracks with lights on and thought it was just a heritage piece, or something like that. As I was crossing the bridge, I heard music and laughter coming from it; I think a party was going on, but when I shouted up, no one heard me. I was also lucky enough to get a photo with the subway. You might be asking why that's lucky. I don't know, I just think a photo of an empty track to be sad or incomplete, or something. The August long weekend approaches, and perhaps I'd better be careful about what I wish for. Knowing how dry and hot it's been in Ontario the past few months, I shared my hope with my family that it rains before the long weekend. Brittany and I are flying back to Ontario to join some friends for a long weekend camping party! Can't have a camping party without fire and you can't have a fire in a forest that hasn't seen rain in 3 months. Well, again, I should be careful what I wish for because today there was a huge storm in Edmonton, Toronto, Ottawa and several other places I'm sure, and it was so bad at home that the power is out and barns were destroyed. My family is okay, thankfully, but there was a lot of damage in the area. I hope everything calms down and I hope everyone gets through it okay. Anyway, I am really looking forward to the long weekend! It's been years since I've hosted such a party, mostly because of working at the marina, and I'm excited to see everyone again. I know Brittany's excited because she'll get a chance to see good friends with whom she has not seen in over a year! Also, I look forward to seeing my family again. I tend to downplay how much I miss them, but I hope they read this and I hope they know that just because I'm independent, doesn't mean I don't wish I could live next door to them. Camping, volleyball, home-grilled food, family, friends, flying, and swimming, the long weekend is going to be spectacular! And that's about it as far as the personal stuff goes. If I get some time this week, I want to catch you up on some of the media with which I've been imbibing lately and my thoughts concerning that. Thanks for reading, and I hope you've been having a great time this summer! Contrary to a message I posted on Twitter last week, it would seem that the excitement for The Dark Knight Rises is, well, on the rise. Diehard fans and those new to the genre alike are anxiously waiting Christopher Nolan’s purported final piece in this epic retelling and remaking of Batman. Everywhere you look, there’s some form of media attention or advertising. From the movie trailers and posters, to things as unique as fake street signs, the message is clear: Batman is coming, and it’s going to be awesome! But, I won’t be there on opening night. I won’t even be there for the first 3 weeks that it opens. 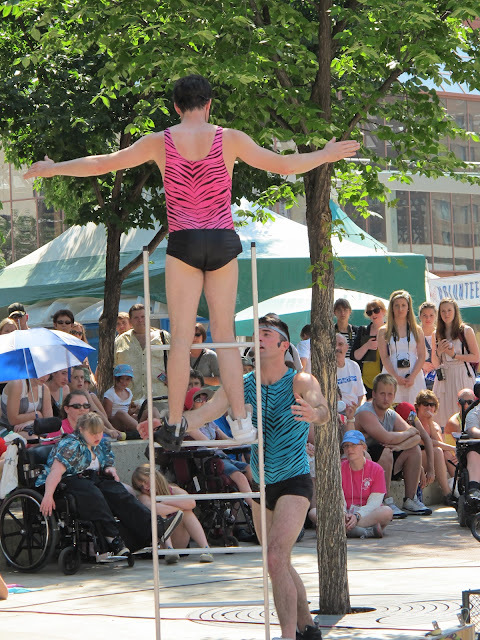 Edmonton's 20th Annual Street Performance Festival! 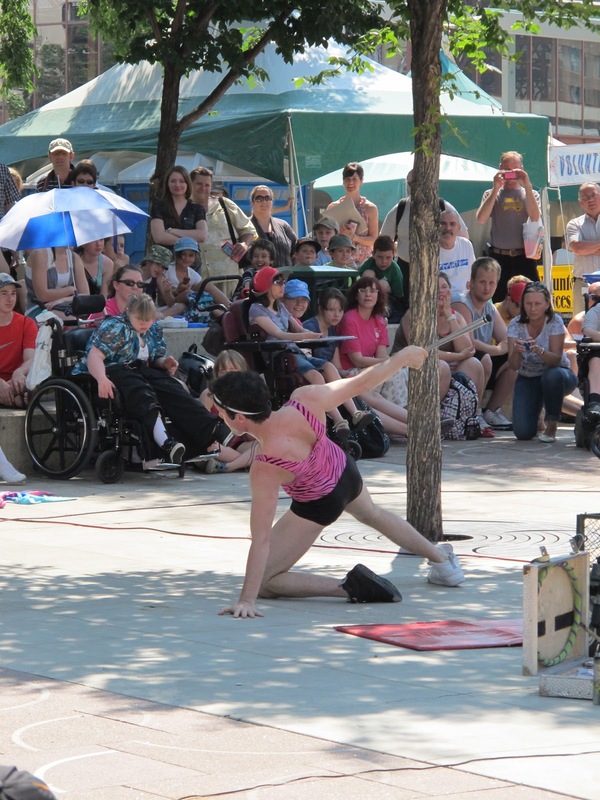 Yesterday, Brittany and I went to Edmonton's 20th annual Street Performance Festival! The last couple of summers in Toronto I had heard about such festivals, but was never able to attend one before because I was always working. We went to Churchhill Square, that place where I took the pictures of the large chess set, fountain, and Art Gallery for a previous post, and it was a hubbub of activity. Yes, a hubbub. It certainly looked the part, with food booths lining the streets, and the smell of popcorn and hotdogs in the air. The temperature was 33 or 34°C and it was quite humid out. This is unusual, as I'm given to understand it, of Edmonton, but seemed appropriate for the event. The first act we saw was called The Lords of Swag. Two men, dressed in bright, entirely too small jumpsuits, performing a dance/comedy act which was pretty entertaining. Lifts, spins, all of that, mixed with working the crowd and infectious smiles, it was a good act upon which to start the day. I was too busy having fun to remember to use the camera on my phone. Thankfully, Brittany had the wherewithal, as well as the extra day (she went back the next day), to take some photos. Here are some of the shots of the Lords of Swag! They didn't do this bit with the ladder when I was there. The next was Antonne, all the way from Montreal's Just for Laughs festival. Dressed in a tuxedo and a Bowler hat, I felt bad for him, considering how hot it was. 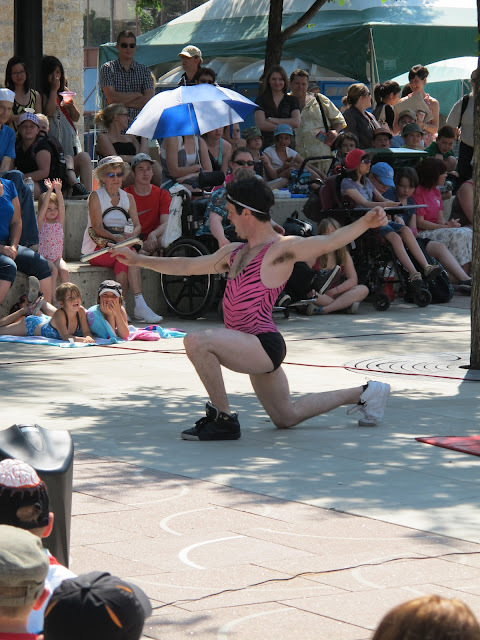 His act was highly skilled, involving sleight of hand, balancing, and he himself was funny and good with the crowd. Enlisting the help of a little boy from said crowd, Antonne dressed the boy up to match him, little tux and oversized hat, and even paid the little boy $10 for his help. It was a nice gesture and the look on the boy's face proved that it made his day. The finale consisted of a delicate balancing act, involving a flaming candle, and some matchstick boxes. Coordinated all to music, I liked his act quite a lot. Wandering around the square, Brittany treated us both to a lemonade, made with real lemons, from a booth which looked, well, like a lemon, haha. Making our way back to where we started, we caught an act which was halfway through. I don't remember his name nor the name of the act, but he played the fool's role splendidly. Japes, juggling, and tomfoolery, he evoked the sympathy and delight of the crowd. Next, was Chairman Jim. Loud and quick-witted, his skit involved a couple of interesting tricks with what he called CPCs, crappy plastic chairs. One trick was particularly interesting; he sat 4 chairs around each other, and a person to each chair. He instructed them to lie back, thus making the knees of one person support another. Once this was done, he removed the chairs, and the foursome was self-supporting. He also stacked the chairs in a most peculiar way and balanced it on his chin. The most entertaining part was when he used two volunteers from the crowd to hold a giant slingshot, which he used to fire bread, donuts, and a bran muffin high into the air seemingly aimed at people across the square. The last was King Pong, the Ping Pong propulsionist. Starting with some neat balloon tricks, including one where he split a balloon over his head without it deflating, making two balloons, and another where he did the same, but made several smaller balloons fitted inside the first. The latter was interesting as neither Brittany nor I had seen that before, and he even was able to use the main balloon as a gun, firing the little ones. The last part of his act involved showing us just how much time he must have spent in his life with ping pong balls in his mouth. He did trick shots, knocking over cans, hitting specific targets, all by shooting ping pong balls out of his mouth. It was interesting, but one of those acts where you kind of think, "Well, I'm glad someone has that talent, someone other than me." And that concluded what we saw. We could have stayed longer, but it was hot, and we had been in the sun for quite awhile. It was nice to get out again, and spend some time together. Work takes up a considerable portion of our lives, and while I get weekends off, she doesn't. It's nice to relax, but sometimes it's nice to get out and I don't really find the notion of wandering around Edmonton by myself to be that entertaining, haha. The next big event to look forward to is my August long weekend party! I'll be flying back to Ontario, (with Brittany!) thereby to spend the weekend with friends and family camping, swimming, and just having some summer fun! I miss all those back home and am really looking forward to it! I thank you all for reading, and promise that I should have some more generally interesting posts sometime in the near future. For now, you'll have to "suffer" through my diary-like process.